Rotherham Council needs another £5m to deliver over 200 new houses on a cluster of sites it owns. The authority is bringing forward some of its "more challenging" sites using a innovative development model. Wates Group, one of the largest privately-owned construction, development and property services companies in the UK, successfully secured a multi million pound tender and is acting as the Council's development partner to proceed with sites in Maltby, Canklow, East Herringthorpe and Dinnington. 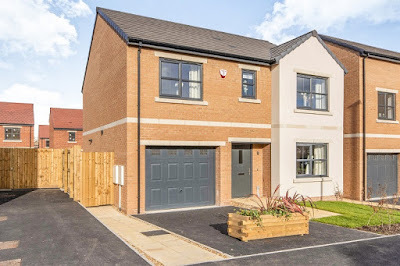 The first houses under the "Rother Living" brand are at Northgate in Maltby. With original overall developments costs of £29m, this week, Rotherham Council's cabinet approved an increase in the budget to enable all 217 homes to be built. A report stated: "At the point of reporting to Cabinet in 2017, the total scheme cost could only be estimated. The sites are extremely challenging and extensive ground remediation work has been necessary to make them developable. Other unforeseeable costs have arisen from utilities diversions and an industry-wide increase in the cost of materials and labour." Cllr. Dominic Beck, cabinet member for housing at Rotherham Council, explained: "We are asking approval for an additional net cost to the HRA [Housing Revenue Account] budget of £4.99m to deliver our site clusters programme that was formerly approved by Cabinet in October 2017. "We were very clear that some of the costs associated with the scheme were based on estimated costs and now we are in a position were we know that little bit more about how much it is actually going to cost the council to deliver those 217 homes across those seven sites. "We are also clear as well that we want to renegotiate the contract with Wates to a fixed maximum price." Discounted options included reducing the overall number of homes being built, and progressing without a guaranteed maximum price. Cllr. Brian Steele, chair of the scrutiny committee at Rotherham Council discussed the rising costs and it was recommended that officers share learning from the contracting on this project to ensure that large scale projects undertaken are well managed and controlled. Rotherham Council has set itself a target of delivering 109 homes during the year via direct Council intervention and is on track to do so. This scheme uses a new delivery route for the Council and creates the opportunity for it to maximise the value of its assets and deliver a greater number of high quality new homes, as opposed to simply selling the individual sites on the open market. Houses sold will lead to sales revenue provided directly to the local authority (excluding a developer's margin) to cross subsidise the development. The Council will also receive the majority share of any developer's profit on the schemes, through retaining the development value of the land.